In an ideal world every bedside table in every hotel should have a USB slot. That’s a pipe-dream, but you would expect a plug to be standard. After all, who doesn’t recharge their smartphone at night AND use it as an alarm clock? But they’re just not that common even in high-end 5-star hotels. Cue this 90cm-long Apple Lightning cable from Griffin. Not only does the Griffin stretch 90cm (that’s five feet!) from the nearest plug (or even your laptop) to the bedside table, but it’s just as useful when you’re in your hotel room and want to surf or watch videos on an iPad while simultaneously recharging. As well as being tough and long, the Griffin has another trick; the aluminium USB connector is what’s ‘universal’. 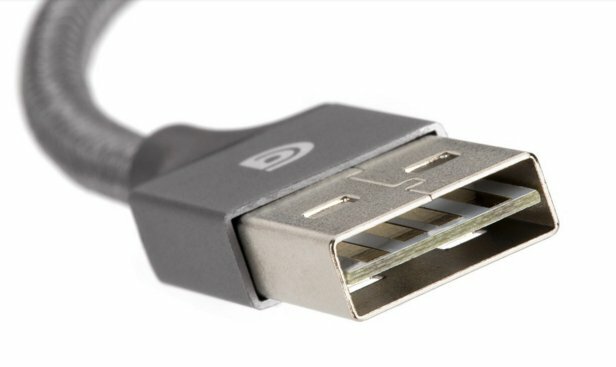 Unlike regular USB connectors that can only be inserted into a plug one way (and almost always not the way you first try! ), this one slots in either way. It’s one less fiddly, annoying thing about modern life removed. If you don’t want to travel with even more cables (and TravGear totally gets that) then consider packing a meaty portable battery like this, this or this for recharging your phone overnight while keeping it near to you. But for those who are all about productivity and convenience, the Griffin’s 5-footer makes a sturdy addition to a business trip suitcase – and we love that easy-insert USB connector.